2 Publications by "C. S. Casas-Delucchi"
Cell cycle progression studies using subcellular markers offer important insight into cellular mechanisms of disease and therapeutic drug development. Due to the large volumes of microscopy data involved in such studies, a manual approach to extracting quantitative information is not only prohibitive but error prone. We present an automatic cell cycle phase identification algorithm applied to 3D spinning disk confocal microscopy imagery of mouse embryonic fibroblast cells. In our training dataset, each 3D image stack depicts a single cell in a manually identified cell phase, and is recorded via two channels showing the fluorescently marked protein PCNA and the chromocenters, respectively. We use a 3D k-means approach to segment each volume and extract a set of shape and curvature features to characterize the subcellular foci patterns associated with cell cycle phases for each channel. Radial features are used to describe the spatial distribution of PCNA over the course of the cell cycle. A support vector machine (SVM) classifier using 234 features was trained and achieved a recognition rate of 83% for the chromocenter and 86% for the PCNA channels separately on the testing data. A combined SVM classifier using both channels and 468 features further improved the accuracy to nearly 92% for five phases (G1, SE, SM, SL, G2) and shows promising scalability. S. Jaeger, K. Palaniappan, C. S. Casas-Delucchi, and M. C. Cardoso. 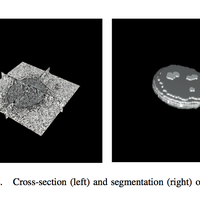 Classification of cell cycle phases in 3D confocal microscopy using PCNA and chromocenter features. 7th Indian Conference on Computer Vision, Graphics and Image Processing, 2010. We present a cell cycle analysis that aims towards improving our previous work by adding another channel and using one more dimension. The data we use is a set of 3D images of mouse cells captured with a spinning disk confocal microscope. All images are available in two channels showing the chromocenters and the fluorescently marked protein PCNA, respectively. In the present paper, we will describe our recent colocalization study in which we use Hessian-based blob detectors in combination with radial features to measure the degree of overlap between both channels. We show that colocalization performed in such a way provides additional discriminative power and allows us to distinguish between phases that we were not able to distinguish with a single 2D channel. S. Jaeger, K. Palaniappan, C. S. Casas-Delucchi, and M. C. Cardoso. 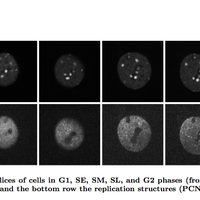 Dual channel colocalization for cell cycle analysis using 3D confocal microscopy. IEEE Int. Conf. Pattern Recognition, 2010.